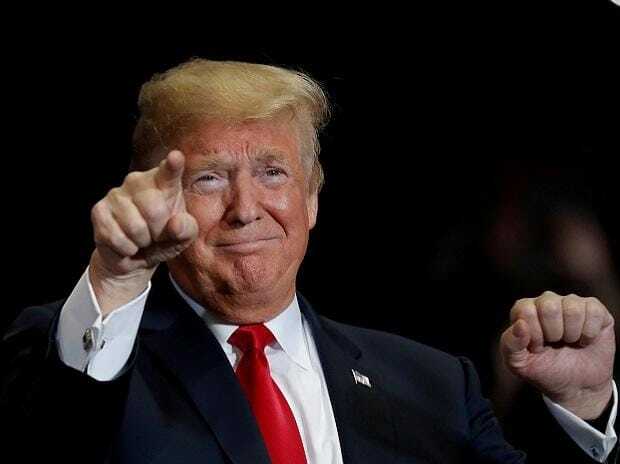 Ruing that talented foreign students are leaving the United States after studying in the country's best educational institutions, President Donald Trump has said he wants people with merit to stay in America and help the growth of companies here. Addressing a press conferences on Friday, Trump said the US is "losing out on great minds" as the country has a "ridiculous" immigration policy. He reiterated his wish to end loopholes in the legal immigration system so as to attract more people based on merit. Trump said his administration wants people to come into the country legally and on merit. We have all these companies coming in. We need great people. But we want them to come in on a merit basis, and they have to come in on a merit basis. They can't come in the way they've been coming in for years, Trump told reporters during a news conference here. "I get calls from the great tech companies, and they're saying we don't allow people at the top of their class, at the best schools in the country, we don't allow them to stay in our country, he said. So, they end up going back to China and Japan and so many other countries all over the world, and we don't keep them. They get educated at our finest schools, and then we don't allow them, through a various set of circumstances, to have any guarantees of staying. So we lose out on great minds. We can't do that, he said. Trump was referring to difficulties being faced by foreign students to stay and work in the US after they complete their education in the country. Trump said that this issue was discussed with Democratic Congressional leadership during a meeting at the White House on Friday. We discussed that with the Democrats, and I think they agree. We're working on that. But we don't want to lose our great companies because we have a ridiculous policy that we won't accept smart people. So, call it politically correct or not, but we have to let these great, brilliant companies have the smartest people in the world, Trump said. He said if somebody wants to seek asylum, there's a way to do that. "There are legal ways to come to this country, and legal immigration has made this country great." Referring to the killing of California's Indian-origin police officer Ronil "Ron" Singh allegedly by an illegal immigrant, Trump said the US needs a "secure border" to keep "Americans safe" and check illegal immigration. America lets in over a million people every single year. By far, the most generous nation in the world. And yet, we have laws that need to be followed to keep Americans safe and to protect the integrity of a system where, right now, there are millions of people who are waiting in line to come to America to seek the American Dream, like Officer Singh did when he sought his chance at the American Dream, he said. That dream was taken. It was taken because we don't have a secure border. We can't let this continue, he said. Trump spoke to the wife and police colleagues of this Indian origin police officer on Thursday. Trump Thursday spoke with the widow and colleagues of the Indian-origin police officer who was killed at a traffic stop on December 26 by an illegal immigrant named Gustavo Perez Arriaga when he was planning to flee to his native Mexico. ...A wonderful, young police officer -- I spoke to his wife yesterday -- was shot, viciously shot, for simply stopping a person that came over the border illegally. Got shot. Killed. We don't want that happening, he said. The president has shut down the government, demanding USD 5 billion for his border wall with Mexico but Democrats have refused to meet the demand. The impasse has left more than 800,000 federal workers furloughed or working without pay since December 22.